With the summer solstice behind us and 3-digit temperatures facing Central Texas, I’ve been giving lots of thought to fermentation temperature control. Fermentation temperature is the most important variable a brewer can control during fermentation, and has a huge impact on flavor. Ales should be kept between 65-72°F during active fermentation, and ideally between 66-68°F for most yeast strains. Too hot and you start to get banana, clove, and bubblegum flavors from esters produced by the yeast (hotter than 80°F and you get fusel alcohols, which give that acrid “firewater” taste associated with cheap spirits). Too cold and ale yeast start go dormant, so fermentation may not complete – although lager yeasts ferment best between 45-55°F. Here in Texas, “too cold” has never been a problem – with sympathy for my friends in Minnesota and Canada – but “too hot” frequently is. So I use a “swamp cooler” to keep my fermentations cool. This is where you place the fermenter in a big tub filled with cold water, and keep the water cold by periodically swapping out frozen ice packs. I also cover the fermenter with a T-shirt to wick cold water up the sides – some brewers even add a fan to the system. Whatever specific variation you go with, it’s a great way to keep fermentation cool on a budget: for the price of a $7 plastic tub at Target, a decent-sized collection of ice packs (or frozen water bottles), an old shirt and that broken fan in your garage that stopped oscillating in 1998, you can easily keep your fermenter 10°F colder than the room it’s in. My Weiss Blau Weiss Bavarian Hefeweizen didn’t get above 73° all last week, despite ambient temperatures in the house of up to 80°. And the only reason it got that high was because I wanted it to. But this method has its drawbacks. For one, temperatures fluctuate quickly, and you need to be able to swap out ice packs every few hours. I work from home, so I can do this; but I can’t imagine making this work with a job outside the house. And overnight, the temperature usually goes up 5-7° by morning (sorry, beer: I love you, but not enough to wake up every 2 hours during the night for you) and it takes time to bring it back down. It’s also messy. Keeping a few gallons of stagnant water in a dark closet for 7-10 days isn’t always a pretty sight. Sometimes, the T-shirt develops mildew and needs to be changed out – unpleasant at best, and a contamination risk at worst (though not a huge one if the fermenter is closed and the airlock filled). And when primary fermentation is done … well, let’s just say that if you’ve ever lifted a plastic bucket containing 5 gallons of liquid wrapped in sopping wet cotton out of a larger plastic bucket, you know how much fun it isn’t. So I think I’m ready to graduate to a chest freezer with a Johnson temperature controller. It’ll be cleaner, easier, and will give me new power as a brewer. No longer will I be tied down brewing wheat beers during the sweltering Texas summer – I can make crisp APAs and blonde ales, knowing I’ll be able to keep the fermentation cool enough to get a good clean flavor. I’ll also finally be able to make some decent Belgian-style ales, which require gradually ramping up the temperature with better precision than I can get in my swamp cooler. Someday, if I get really crazy, I may even try my hand at making a lager. I just need to find a freezer that’s big enough for my 8-gallon fermenter but small enough to fit through the door of the Harry Potter closet. It’ll cost a bit of money, but it’s an investment in better beer and more versatility. And really, isn’t that what being a homebrewer is all about? As homebrewers, we often have a tendency to throw a bunch of different ingredients into recipes just because we can. Sometimes economy’s the reason, like using 5 grams of 8 different bittering hops because they’re in the freezer and about to expire. Other times, it’s just plain stubbornness, like the tendency of American homebrewers (myself included) to put crystal malt in everything. But it’s good to be reminded that sometimes, simplicity is best. After all, humans have been brewing for thousands of years, and the ancient Sumerians certainly didn’t have eight different kinds of debittered black malts to choose from. My lesson in simplicity this week is a Bavarian Hefeweizen I brewed Sunday. I called it Weiss Blau Weiss. 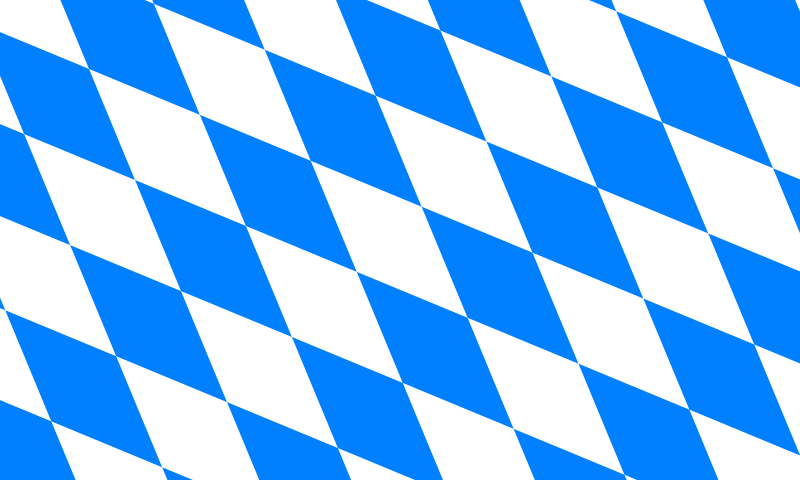 The name means “white-blue” and is an homage to the flag of Bavaria, a pattern of white and blue diamonds (called “lozenges” or sometimes “fusils” – your heraldry lesson for the day) seen at German-themed beer events all over the world. You remember this, don’t you? You puked on it last Oktoberfest. I brew mostly wheat beers in the summer, because they ferment better in the warm temperatures we face in Texas in the hottest part of the year. But most of my wheat homebrews in the past have been American-style wheats, fermented with White Labs WLP320 American Hefeweizen Ale Yeast. It’s a great clean-fermenting yeast, and I recommend it for any wheat ale with fruit, herbs or spices. But I’m bored with that clean flavor lately, and I’ve been enjoying commercial wheats with the kind of clove/banana esters that come from German hefeweizen yeast strains. So after a lot of deliberation (and with input from my soulmate and recipe consultant Lisa, who talked me down off the ledge of including some exotic spice such as mahlab in the boil) I decided to keep it simple with a traditional Bavarian hefeweizen – simple grain bill and simple hops, allowing the ester character of a German yeast strain to come through. I mashed at 152°F for an hour. Using two different Hallertauer varieties may seem unnecessarily complex in this so-called “simple” beer. But I really dig Saphir, and I had 0.6 oz in my freezer, which wasn’t enough. So I supplemented the Saphir with ordinary Hallertauer to get an ounce for bittering and a little extra for flavor, while using up my Saphir backstock (see? economy). In the end, I liked the symmetry of splitting the hop additions 50/50, same as the grain, so I ran with it. The OG of the wort was 1.052. I pitched a smack pack of Wyeast 3068 Weihenstephan Weizen with no starter, hoping the low pitching rate will promote ester production. I’m also keeping the fermentation temperature between 68-72°F for the same reason. The word hefe in hefeweizen is German for “yeast”, and I want the yeast esters to take center stage. On Monday, the beer was fermenting so vigorously I had to replace my airlock with a blowoff hose – always a proud moment for any brewer. Today, it’s still bubbling several times a minute. Assuming it’s done fermenting by this time next week, I plan to keg it immediately. Hefeweizens are great consumed fresh, and while I don’t think a longer conditioning period would hurt it, I don’t see it helping much … plus, I have an empty tap on the kegerator ready for a new beer! It was hard, but I think keeping it simple will serve this beer well. While I love creativity in brewing, and there’s a strong desire to be original by throwing the kitchen sink into every recipe, sometimes one needs to dial it back and focus on the basics, the minimum needed to make a good beer in a classic style. And as with so many other things, part of being a good brewer is knowing what not to do, as much as knowing what to do. The May/June 2012 issue of Zymurgy magazine includes an article entitled “Secrets of Gluten-Free Brewing”, by BellaOnline beer and brewing editor, Carolyn Smagalski. In it, she gives tips to homebrewers on ingredients for true gluten-free beers, and reports on gluten-free offerings from a number of commercial breweries including Strange Brewing Company in Denver and Dock Street Brewery in Philadelphia. Even Dogfish Head’s Sam Calagione, ever the zymurgic Rick O’Connell, has adventurously entered the gluten-free ring with Tweason’ale, a champagne-like beer with sorghum, buckwheat honey, molasses, and strawberries. It’s a great article, and interesting because I’ve always been curious about gluten-free brewing. First of all, I must stress that I am not a physician, nor am I an expert on gluten, gluten-free brewing, or food allergies and I cannot attest to the safety of any ingredient mentioned in this article. Please check with your physician before brewing or drinking a beer made with any ingredient mentioned here. I don’t suffer from celiac disease, wheat allergies or any other kind of gluten intolerance. But I have friends who do, and I know it must be hard. What if my doctor ever told me I couldn’t drink beer anymore? What would I do? I could always put more energy into cider and mead, but beer is really my passion as a zyme lord. So my empathy glands pulsate to make good beer my gluten-free friends can drink, even though none have asked. Because gluten is present in most common grains, the key to gluten-free brewing is finding alternative sources of fermentable sugar. Barley, wheat, rye, oats and even spelt are off the table. But sorghum, buckwheat, corn, rice, millet, and quinoa are recommended alternatives. These grains may not yield as much sugar as brewers are used to, so it’s common to add other fermentables as well, such as honey or corn syrup. Hops are gluten-free, but yeast should be carefully selected, since most of them are grown in traditional barley wort (Lallemand’s Danstar beer yeast and Lalvin wine yeast product lines are listed by Smagalski as gluten-free, being grown in potato starch). While sorghum has been used in gluten-free beers for years now, it’s notorious for being kinda … well, awful. I’ve never had one, but I’ve also never heard of anyone drinking a sorghum beer by choice. But other grains Smagalski listed were inspirations to me. I eat quinoa about twice a week, and would love to try it in beer. I don’t know much about buckwheat, but have been thinking about buckwheat honey in a mead: why not a gluten-free braggot of buckwheat and buckwheat honey? There’s also a recipe for a chestnut beer in the article. Apparently chestnut starch can be converted to sugar, but must be “mashed” for 12 hours with added amylase enzyme powder – they don’t have enough diastatic power on their own. 12 hours is a long mash to start a brew day, but this might be a worth while experiment. Even without a specific need in my household for gluten-free beer, I smell a possible holiday brew in the cards. “Chestnuts Steeping in an Open Mash Tun Holiday Ale”? It’s catchy. Anyone out there brewing gluten-free beers? I’d love to hear from you, as this is something I really want to explore. Who’s up for an adventure?